Home Business Analytics How to find inefficient branches when considering multiple outputs? Recently, I was working on a business problem, which required me to find out inefficient branches of a bank X in North America and find root cause of their inefficiencies. I had solved several root cause analysis problems in past but finding a quantitative parameter for efficiency was new to me. This was a complex task because efficiency was derived from multiple target variables such as branch revenue vs. capacity, customer satisfaction index, policy persistency etc. Can we assign some weights to each of the target variable and sum them to get efficiency? But how will we get such weights? Is there a scientific way to get these weight? I did a small research and found a method using simplex programming to obtain efficiency in problems involving multiple input and output parameters. This technique is commonly known as Data Envelopment Analysis. Even though its a popular technique in OR, it is not very common in analytics industry. This article will give you a brief layout of the formulation and explain its utility by a business case. The efficiency figures are now swapped. 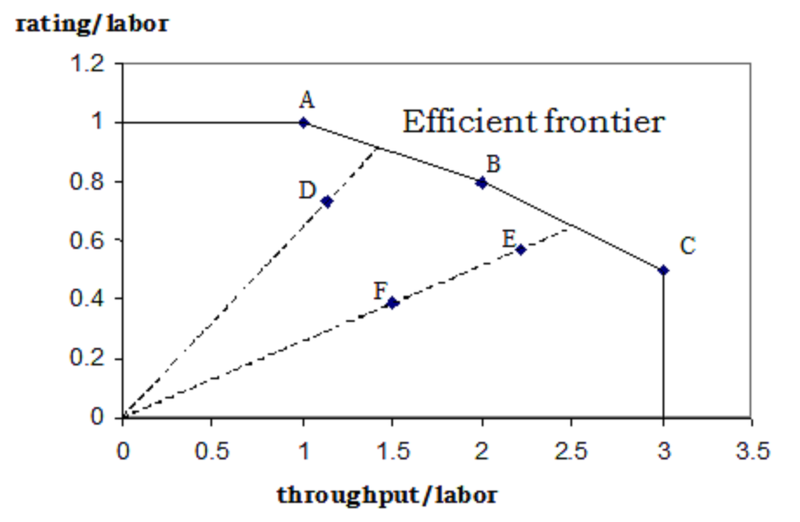 Process B seems to be more efficient when only office Area costs are considered. Now in this case, we know the office rent/square feet. Hence we can calculate the total cost, i.e. sum of Office rent/week and labor cost/week. And determine total efficiency of the two processes using total costs. What made the determination easy for this case? We already knew the weights to be applied on each of the input variable i.e. Office Area and Labor cost. The weight for Office area was rent/square feet and that of labor cost was one. First step in any efficiency problem is to identify independent inputs and outputs. Make sure that the inputs and outputs are independent variables. In the above scenario, Employee salary and Branch Rent is in terms of dollars, Competition index (Degree of competition in locality) is an index and Management time share is a percentage term. Clearly Input variables are non additive. 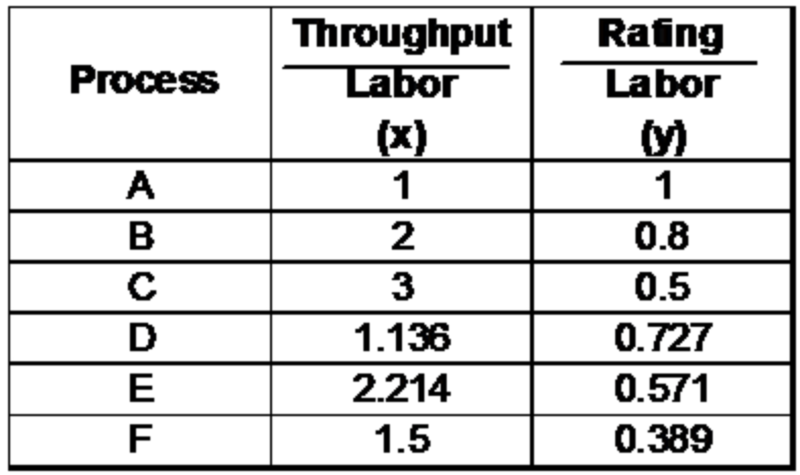 Similarly, output parameters are non-additive as well. We will derive an effectiveness of each branch using all these variables. 1. 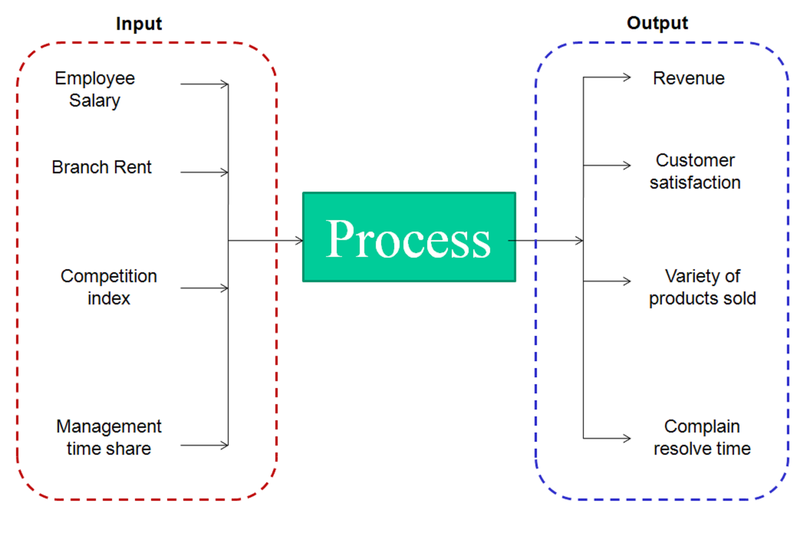 The Input and Output of each business unit are linear functions. 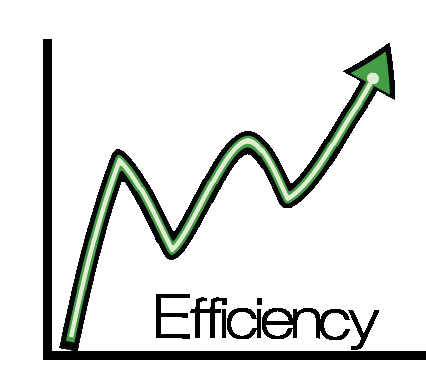 Lets plot the two efficiency graphically. As the name suggests, DEA defines an envelope of 100% efficiency. ABC is the envelope and any point inside the envelope is an inefficient unit.The graphical representation was easy for a two dimensional problem. But for the bank branch problem discussed in the last section, we will have to draw a 9 ( 4-1 * 4-1) dimensional envelope and hence very difficult to visualize. DEA is a very useful technique when it comes to comparing efficiency and finding best practices. DEA defines an efficiency envelope and all units inside the envelope are inefficient. Solving the linear programming equation not only gives us efficiency of different units but also establishes relative weights of each input and output variable.Using DEA, I was able to score efficiency of each branch and find the relation between different parameter. Using these metrics, I was able to do a root cause analysis for branch inefficiency and establish branch best practices. What do think of this technique? Do you think this provides solution to any problem you face? Are there any other techniques you use to find efficiency of different business units? Are you able to tackle the linearity assumption with this technique? Do let us know your thoughts in comments below. Hi Tavish. I like this approach. It reminds me of a similar concept used in Economics for determining efficient frontiers. But what if I wanted to take this one step further and analyse more than 2 inputs. How would this method apply? As I understand, this method as explained in your article only includes 2 inputs which can be plotted on the X & Y axis. Is the a way to graphically present more than 2 inputs? The method can be used to any number of input (say i) and any number of output (say o). The graphical representation is only illustrative of how method works and is restricted to two output. You can use the simplex formulation discussed in the article to handle both multiple inputs and multiple outputs. Hi Tavish. I tried your suggestion on a project I was working on and it worked. The results provided a more robust solution to the problem. Thanks. Great. Do you mind sharing what was the objective of the analysis.